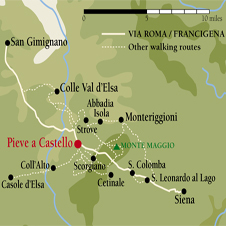 We walk from Pieve a Castello following ancient tracks to nearby Colle Val d’Elsa where we visit the fortified, medieval ‘colle alta’ and its tunnel streets, and lower town with ‘le gore’ – an ancient water system powering this ‘town of mills’. Evening presentation: 'The Anti-chamber of Paradise'. We spend the morning in Siena, discovering the history and outstanding art and architecture of the Cathedral complex. A leisurely early evening stroll ('la passeggiata') takes us up to iconic Monteriggioni, with its high walls, 14 watch towers and 85 inhabitants, and to dinner at a local restaurant. We drive (20 mins), then walk up a track with panoramic views of San Gimignano, the ‘medieval Manhattan', surrounded by olive groves and vineyards. After walking through the town, we continue down into the scenic hills to the Elsa Valley to visit the fortified village of Certaldo, birthplace of Boccaccio. We return to Pieve a Castello for a concert in the church before dinner. We drive (35 mins) to visit Villa Geggiano, just outside Siena, with its elegant gardens, theatre and wonderful views over the city. After returning for lunch there is the option of a walk following the ancient Via Francigena through forests of the Montagnola to a frescoed church and hermitage. Evening: gala dinner. I just want to say that is it a tribute to you that you manage to find such outstanding staff. Everything at Pieve is quiet superb, in an age when one has become used to everything being done to a price. Thank you. The destination airport for this walking holiday in Tuscany is Florence. There will be a set meeting time for the transfer to Pieve a Castello; and a set time for the return transfer to the airport at the end of the trip. Please check timings with the Reservations Team before booking your flights if you plan to take the transfers. You are of course welcome to travel independently and meet the group at Pieve a Castello, however please ensure you arrive after 3pm.